The Irish economy has moved beyond the recovery phase and into a period of “strong and sustainable growth” with expansion forecast to reach 4.2 per cent in 2018, according to the employers’ group, Ibec. In its latest quarterly economic outlook, it adds that the "net wealth position" of households has never been better. Ibec estimates that growth for 2017 will come in at 5.9 per cent. Its report paints a positive picture for the economy on almost all fronts, predicting growth will be strong enough to outweigh any immediate negative impacts from Brexit-related uncertainty. Ibec predicts that investment in the economy will grow by 10.7 per cent in the coming year, while consumer spending will rise by 3 per cent. It also suggests that exports will grow by 3.8 per cent in 2018, as consumers recover their confidence as the economy nears full employment and household debt levels fall. The report also draws a distinction between the current phase of growth and the frothier expansion that characterised the pre-crash “Celtic Tiger” years. “The current phase of growth is also more sustainable than the pre-crisis period in that it is underpinned by business investment rather than unsustainable credit flows,” says Ibec. The forecasts have a few caveats, however. Ibec warns that “the risk of losing competitiveness will need to be carefully managed over the coming years”. It also highlights economic leakages such as cross-Border shopping, and warns that falling food prices are eroding margins for producers. It also says Irish rents are rising at six times the European median and predicts that “a failure to resolve the housing crisis will eventually lead to higher prices on other goods as well”, as it will force employers to boost wages even higher, which will be passed on to consumers. Ibec reports that 55,000 net new jobs were created in the economy in 2017 and says the disposable incomes of Irish households are growing at four times the euro-zone average. 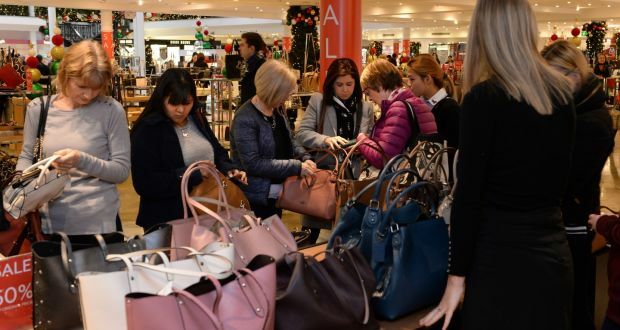 It predicts that consumer spending over Christmas will come in 2.6 per cent ahead of the previous year. It says it is clear, however, that Irish households are “more cautious” about carrying debt than in the last major period of economic expansion up to 2007. Irish households now have €4 billion more on deposit than they have outstanding in loans. “Although the overall level of household assets (including housing) may have been higher during the [last] boom period, these assets were highly leveraged. As a result the net wealth position of Irish households in nominal terms has never been better,” says Ibec. It says growth in employment, which it predicts will top 2.2 per cent this year, will slow as the economy nears full employment, which could effectively arrive before the end of the year unless Ireland attracts home its returning emigrants at a faster rate. “The major question facing the economy over the coming years will continue to be the ability of the economy to meet the needs of a growing population in a sustainable manner. Major challenges are already clear in the housing sector,” said Gerard Brady, Ibec’s head of tax and fiscal policy. Elsewhere, Ibec says US president Donald Trump’s inflationary policies could risk an overheating of the US economy, while the organisation says the UK’s objective of wrapping up Brexit and trade talks by early next year are “unrealistic”.